DAHLGREN, Va. – The Dahlgren Heritage Museum will celebrate its grand opening on Wednesday, April 13, from 4:30 p.m. to 6 p.m. on the museum grounds at 3540 James Madison Hwy. in King George, Va. The event marks the start of an expanded operating schedule for the museum, which will be open Wednesday through Sunday from 10 a.m. to 5 p.m. beginning April 13. The museum will be open for visitors for the grand opening commemoration, which will include refreshments and feature a short program of guest speakers to include Virginia Senator Richard Stuart and Virginia House of Delegates Speaker Bill Howell. The Dahlgren Museum originally opened its doors in October 2013, but limited staff and resources restricted the hours that the facility could be open to the public, typically just on Saturday afternoons. Ed Jones, president of the Dahlgren Heritage Foundation, said that an expanded five-day-a-week schedule is the most important development to date in the museum’s five-year existence. The Dahlgren Museum’s expanded operation is being made possible through expanded financial support that has come in the form of both private and corporate grants and through partnerships with local governments. “Our intent is to turn the Dahlgren Museum – which was the previously long-closed former Gateway Welcome Center – into a better-than-ever support facility for the Northern Neck region, combining the advantages of a tourism center and a history/science museum,” says Jones. The grand opening also serves to kick off additional special events at the museum over the coming months to include guest speaker programs and educational activities for students. Currently on the schedule will be a “First Thursday” speaker series featuring Dr. James Colvard, former technical director for the Naval Surface Warfare Center at Dahlgren and deputy director of the Office of Personnel Management. Scheduled for May 5, June 2 and July 7, each “First Thursday” session will begin at 4:30 p.m. with light refreshments. The hour-long sessions – which will address Dahlgren’s evolution and its expected contributions to the Navy of the future – will be free and open to the public. 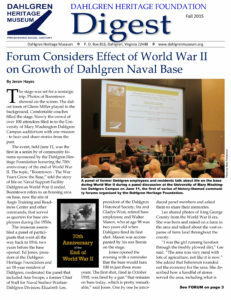 The Dahlgren Heritage Foundation is chartered to establish and operate the Dahlgren Heritage Museum and to provide the long-term preservation efforts and educational activities associated with sharing the stories and interpreting the U.S. Navy’s physical, technical, intellectual and social contributions to King George County, the Commonwealth of Virginia, and the nation.